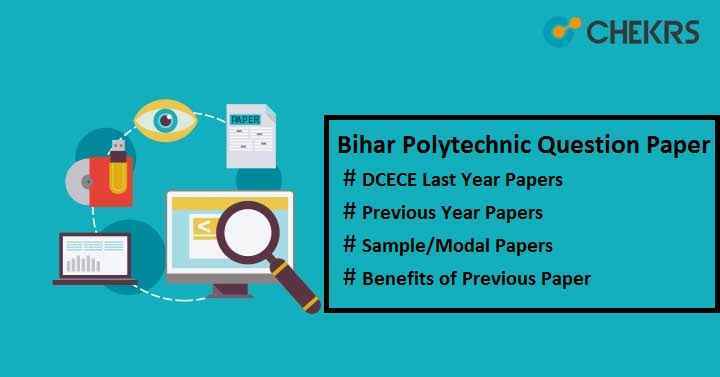 Bihar Polytechnic (DCECE) Question Paper 2018: Bihar Polytechnic Entrance Examination (DCECE) is conducted every year for candidates seeking admission into various polytechnic courses in engineering or non-engineering field. BCECEB will release the notification for admission in the month of February. To score maximum marks in Bihar polytechnic entrance exam, candidates should first complete the DCECE syllabus and then check the DCECE Previous Year Question Papers to get familiar with the exam pattern. It will help to you to know the weightage of important topics. Here we have provided the Bihar Polytechnic Question Papers to help you so that you can begin your exam preparation from today onwards. Students who have completed the exam syllabus and are in search of DCECE Sample Papers can download the papers from here. If you want to brush your knowledge, you should practice the previous year question paper on regular basis. In order to get the highest score and clear the exam, candidates should take the help of Bihar Polytechnic Previous Year Question Paper as you will be able to learn how the question will be asked, the level of difficulty of the paper, what to study, subject-wise marking scheme etc. DCECE Previous Year Papers gives idea about the paper level, what type of question being asked, what to study for the exam etc. Most important you can learn how to manage the time. How to complete the whole paper in less time. Solving last year papers help you to know your weak point. You can give more time on your weak point and improve the speed & accuracy. Hope that with the help of Bihar Polytechnic Question Paper you learn how to manage your time, know the overview structure of paper and many things. So download the papers from here and start preparing from now. Good Luck!! !